The Manhattan Institute for Policy Research (renamed in 1981 from the International Center for Economic Policy Studies) is a conservative 501(c)(3) non-profit American think tank focused on domestic policy and urban affairs, established in New York City in 1977 by Antony Fisher and William J. Casey. The organization describes its mission as to "develop and disseminate new ideas that foster greater economic choice and individual responsibility". Its message is communicated through books, articles, interviews, speeches, op-eds, and through the institute's quarterly publication City Journal. Other books on supply-side economics published during this era include The Economy in Mind (1982), by Warren Brookes, and The Supply-Side Solution (1983), edited by Timothy Roth and Bruce Bartlett. The latter declares in its first sentence: "As accepted economic theory, orthodox Keynesian economics is dead". The Institute sponsored a documentary film in 1983 based on the book, The State Against Blacks, by George Mason University professor Walter E. Williams. The film debuted on New York area public TV station WNET on June 27, and presented Williams's thesis that government policies have done more to impede than to encourage black economic progress. In 1982, the Institute paid $30,000 to a little-known social scientist named Charles Murray to write what became his landmark book, Losing Ground, published in 1984. The book paved the way for federal welfare reform in 1996. In 1990, the Institute founded its quarterly magazine, City Journal, in response to New York City's downward spiral and broader anxieties about the perceived decay of American cities generally. City Journal has been called "arguably America's best magazine" by economist Thomas Sowell,  and "the great Fool Killer in the arena of urban policy" by novelist Tom Wolfe,  City Journal has articulated and promoted ideas that have been credited with driving the urban renaissance of recent decades. The magazine was edited by Peter Salins and then Fred Siegel in the early 1990s. Fortune editor Myron Magnet was hired by the Institute as editor of the magazine in 1994, where he served until 2007. As of 2018 [update], the magazine is edited by Brian C. Anderson. Lawrence J. Mone was named president of the Institute in 1995, taking over from William H. Hammett. He joined the Institute in 1982, serving as a public policy specialist, program director and vice president before being named the Institute's fourth president. The Institute established the Center for Education Innovation (CEI) in 1989, an organization devoted to transforming public education by shifting accountability from bureaucracies to schools as a means of creating public school choice. The CEI helped create a number of small, alternative public schools in New York and advised New York Governor George Pataki in crafting the state's landmark charter school law in 1998, which authorized the creation of autonomous public schools. To this day, the Institute works closely with school officials to promote the idea of school choice nationwide. The Institute enjoyed close ties to the administration of New York City Mayor Rudy Giuliani, who had become a regular at Institute luncheons and lectures after his failed mayoral campaign in 1989. Violent crime in New York City had recently hit a peak of 2,245 homicides in 1990. The Spring 1992 Issue of City Journal was devoted to "The Quality of Urban Life", and featured articles on crime, education, housing, and the serious deterioration of the city’s public spaces. The issue caught Giuliani's eye as he prepared to run for mayor again in 1993. The campaign contacted City Journal editor Fred Siegel to develop tutorial sessions for the candidate with experts on education, housing, and crime. Among the policies embraced by his administration was the "broken-windows" theory of policing, which had already begun to be adopted on some levels by leadership in the NYPD. After the attacks on the World Trade Center on September 11, 2001, the Institute formed the Center for Tactical Counterterrorism (CTCT), later renamed the Center for Policing Terrorism (CPT). The group was created at the request of the NYPD, to provide research into new policing techniques with the goal of retraining officers to become "first preventers" to future mass-casualty attacks. Led by executive director R.P. Eddy, the CTCT held a conference with highly regarded counterterrorism experts in the world and developed a strategy to transform the NYPD's approach to urban counterterrorism by blending intelligence gathering and analysis with traditional policing. One of the most visible components of this new approach was the overseas liaison program, which placed NYPD officers with police departments in foreign countries for the purposes of intelligence gathering, relationship building, and information sharing. Eddy brought on board Tim Connors, a West Point and Notre Dame Law School graduate, to oversee the day-to-day operations of the CTCT. The CTCT began publishing reports and white papers on intelligence fusion centers, local counterterrorism strategies, and intelligence-led policing. With the research assistance of Institute staffers Mark Riebling and Pete Patton, the center produced rapid-response briefings on major terrorist attacks around the world and presented them at weekly meetings with the Counterterrorism Bureau. The Institute's counterterrorism strategy also built upon Broken Windows and CompStat policing models by training police in problem-solving techniques, data analysis, and order maintenance. In January 2005, the CTCT cautioned against the construction of a new United Nations structure over the Queens Midtown Tunnel, which would have increased the value of the tunnel as a potential terrorist target. CTCT, and later CPT, continued publishing research until 2008 when it was absorbed into National Consortium for Advanced Policing. In other areas of policy concern, the Institute's director of legal policy James R. Copland in 2003 began a long-running series of surveys on the civil litigation industry called Trial Lawyers, Inc. Building on previous work in civil litigation by fellows Olson and Huber, the series aims to survey civil litigation industry, highlight abuses by attorneys, and provide a readable source of information on current and trending practices. Since the 2000s, the Institute has added a number of experts in infrastructure and municipal financing. Harvard professor Edward Glaeser and New York Post columnist Nicole Gelinas joined the Institute in 2004 and 2005, respectively. In 2011, Edward Glaeser released his hugely-influential book, Triumph of the City, in which he makes an urgent case for the importance and splendor of cities. Healthcare expert Avik Roy joined the Institute as a senior fellow in 2011. In that year, Roy's highly acclaimed healthcare policy blog "The Apothecary", begun in 2009 in response to the Patient Protection and Affordable Care Act, was picked up by Forbes and integrated into their website in 2011. Roy's blog went on to become one of the most influential conservative voices on health care policy. In 2014, the Institute published Roy's replacement proposal for the Affordable Care Act, in a report called Transcending Obamacare. In 2012, conservative social critical and Institute senior fellow Kay Hymowitz released Manning Up: How the Rise of Women Has Turned Men into Boys, arguing that too many American men in their 20s have started to prolong adolescence. Governing magazine columnist and urban-policy blogger Aaron Renn also joined the Institute in 2012. President Bush addresses a meeting of the Manhattan Institute at Federal Hall National Memorial on November 13, 2008. Carly Fiorina, Vanessa Mendoza, and Marilyn Fedak at the Adam Smith Society national meeting in New York City on February 21, 2014. Economics21 (E21) joined the Institute in 2013 as the organization's Washington-based research center focused on economic issues and innovative policy solutions, led by the former chief economist of the U.S. Department of Labor during the Reagan administration, Diana Furchtgott-Roth. E21 has a partnership with the Shadow Open Market Committee, which was established in 2009, prior to its association with the Institute. The independent group of economists meet twice a year to evaluate the policy choices and actions of the Federal Reserve's Open Market Committee. E21 partners with the Shadow Open Market Committee (SOMC), an independent group of economists, first organized in 1973 by Professors Karl Brunner, from the University of Rochester, and Allan Meltzer, from Carnegie Mellon University, to provide a monetarist alternative to the views on monetary policy and its inflation effects then prevailing at the Federal Reserve and within the economics profession. Its original objective was to evaluate the policy choices and actions of the Federal Open Market Committee (FOMC), but has since broadened its scope to cover a wide range of macroeconomic policy issues. With members drawn from academic institutions and private organizations, the Committee meets semi-annually and publishes position papers on its website. The Alexander Hamilton Award Dinner was created in 2001 to honor those individuals helping to foster the revitalization of our nation's cities. It is named after Alexander Hamilton because, like the Institute, he was a fervent proponent of commerce and civic life. Throughout the years, the Institute has expanded the scope of the prize to celebrate leaders on local, state, and national levels, working in public policy, culture, and philanthropy. Past honorees include: Daniel Patrick Moynihan, William F. Buckley Jr., Rudolph Giuliani, Tom Wolfe, Rupert Murdoch, Raymond Kelly, Henry Kissinger, Cardinal Timothy Dolan, Bobby Jindal, Paul Ryan, Jeb Bush, George Kelling, and Eva Moskowitz. The Institute's research seeks to develop and promote free-market ideas and is focused generally on urban policy, education, public finance and pensions, energy and the environment, health policy, legal reform, and economics. In all these spheres, the Institute's fellows approach their work from the perspective that economic choice and individual responsibility are critically important to successful public policy. The Institute's research is presented at conferences and in reports, op-eds, and testimony before government committees and panels. The Institute addresses both national and local issues, with state and local policy research focused on municipal finance, public pensions, infrastructure, welfare, policing, and housing. Helping municipalities and states manage their budgets and public-employee benefits systems have been a key part of the Institute's research work. The institute has long focused on the health of American cities, a theme of its 1997 book, the Twenty-First Century City: Resurrecting Urban America, authored by then-Indianapolis Mayor Stephen Goldsmith, who later served as Chairman of the Institute's Center for Civic Innovation, More recently, the Institute has begun an annual series of books featuring innovative ideas for urban policymakers. 2015's The Next Urban Renaissance featured proposals to expand affordable housing; improve urban transportation; implement entrepreneurship zones; rethink the economic anxiety around "brain drain"; and improve pre-k education. 2016's Retooling Metropolis featured proposals to use technology to improve the enforcement of public health regulations; to implement pricing mechanisms that could address urban parking shortages; to use microunits as a tool to promote affordable housing; and to improve procurement policies for municipal governments. George Kelling stands with leaders of the Detroit Police Department and other local officials at a press conference in 2013. The Department partnered with Manhattan Institute for new ways to protect the neighborhoods in the area. The Institute has pioneered reforms in policing, most notably the use of community policing methods and more specifically quality-of-life policing, also known as " broken windows theory" after the landmark 1982 Atlantic Monthly article "Broken Windows" by James Q. Wilson and George L. Kelling. Broken Windows posits that dealing more effectively and comprehensively with low-level quality of life crime would reduce more high-profile violent crime. Broken Windows policing was put to its first major large-scale test in the mid-1990s after the election of Rudolph Giuliani as mayor of New York City. Giuliani was an outspoken advocate of community policing, frequently citing the influence "Broken Windows" had on his thinking as mayor. Giuliani appointed Kelling's intellectual collaborator William J. Bratton as New York City Police Commissioner in 1994, saying, "I chose Bill Bratton because he agreed with the Broken Windows theory". In 1998, George Kelling and Catherine Coles expanded on this idea in their book, Broken Windows: Restoring Order and Reducing Crime in Our Communities, arguing that control of disorderly behavior in public places generally will lead to a significant drop in serious crime. Police chiefs like William Bratton (in both New York and Los Angeles) have implemented "broken windows" and related policies, and have reported falling crime rates. 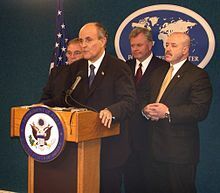 Former New York Mayor Rudy Giuliani with New York City's former Police Commissioner Bernard Kerik, former Fire Commissioner Thomas Von Essen and former Director of the Office of Emergency Management Richard Sheirer at a press briefing in 2002. In the higher education world, Institute senior fellow Beth Akers is a leading advocate for reform of the federal student loan and financial aid system. According to Akers, coauthor of Game of Loans: The Rhetoric and Reality of Student Debt (2016), the system is simply far too complex for the average student or parent borrower to navigate well. She argues that the Department of Education should simplify federal financial aid, adopt a single, income-driven repayment plan for federal student loans, and bring market discipline into student lending in innovative ways. In March 1989, The Institute employed Seymour "Sy" Fliegel as a senior fellow and launched the Center for Educational Innovation (CEI). A former deputy superintendent of East Harlem's Community School District 4, Fliegel had launched a program in September 1970 to transform failing schools in District 4 into thriving, small, community-based schools. Fliegel and Institute senior fellow James Macguire wrote a book, The Miracle of East Harlem: The Fight for Choice in Public Education, to demonstrate how education reform can be achieved one school at a time. The Manhattan Institute has since launched a website, SchoolGrades.org, that ranks schools nationally based on a normed measure linked to the federal government’s NAEP (National Assessment of Educational Progress) exam. Institute fellows highlight how abundant and affordable power helps fuel growth and prosperity across the globe. The Institute's energy policy research is focused on climate, geopolitics, regulations, and technology. In 2005, Institute senior fellows Peter Huber and Mark Mills released the book The Bottomless Well, which disputes several popular beliefs about energy. Bill Gates described it as "the only book I’ve seen that really explains energy, its history, and what it will be like going forward". Published amid concern about " peak oil", the book points out that expanding energy supplies mean higher productivity, more jobs, and a growing GDP. Mills has written extensively on the geopolitical opportunities presented by the American energy sector. In a 2016 report, he argued that there has "never been a more opportune time for America to capture the geopolitical 'soft power' benefits from greater oil production and exports". Further, Mills makes the case that the U.S. is poised for a boom in the shale oil industry, driven by technological advancements—specifically big-data analytics. In keeping with its commitment to free-market economic principles, the Institute is opposed to high-cost, inefficient government mandates and subsidies. For example, Robert Bryce has written in favor of repealing both the Renewable Fuel Standard and the tax credit for electric vehicles. Bryce has argued at length that, even with exorbitant government subsidies, renewable energy sources are simply inadequate to meet America's energy needs. He has also argued for the expansion of U.S. nuclear energy as a clean fuel source with unsurpassed power density. The Institute's health policy team promotes policy reforms asserted to empower patients and consumers by encouraging competition, transparency, accountability, and innovation. The Institute's research in this sphere is focused on Food and Drug Administration (FDA) reform, the Affordable Care Act, and Medicare/Medicaid. The Institute has taken a critical view of the Affordable Care Act (ACA) since its inception. In 2013, to enable policymakers, researchers, and everyday Americans to understand more fully the effects of the ACA, the Institute released its Obamacare Impact Map, a joint project of health policy fellows Paul Howard, Avik Roy, and Yevgeniy Feyman. In 2014, the Institute published then senior fellow Avik Roy's proposal for its replacement, titled "Transcending Obamacare". According to Roy, while the ACA delivers on the goal of reducing the number of uninsured Americans, it does so by increasing the cost of U.S. health coverage. More recently, in 2017, the Institute released a report by Yevgeniy Feyman advocating the use of 1332 "state innovation" waivers giving states the flexibility to increase choice, competition, and affordability under the ACA. The Institute's health care scholars  oppose allowing the federal government to negotiate prices in the Medicare Part D prescription drug program  and believe that drug price negotiating has adverse effects in the Veterans Administration. Paul Howard argues that the first step in reforming Medicaid is for Congress to enact per-capita spending caps. In 2016, Howard argued that California’s Proposition 61–a measure that would have imposed price controls on some prescription drugs in the state – was a flawed proposal that might have actually increased drug prices. Many of Howard’s criticisms were echoed by newspaper editorial boards throughout the state and the measure, which had been favored by wide margins just a few months prior, ultimately failed by a 46-54 vote in the November 2016 election. The Institute's legal scholars author policy papers on various aspects of legal reform. The Center for Legal Policy regularly writes on overcriminalization, corporate governance, and civil litigation reform. Corporate governance reports usually focus on proxy voting records. Overcriminalization  issue briefs typically study the growth of the criminal law in state penal codes. Proposed reforms to America's lawsuit practice are published under the center's ongoing publication of Trial Lawyers, Inc.  Institute legal policy fellows like James Copland contend that the rule of law in modern America is increasingly being eroded by trial lawyers, prosecutors, and socially oriented shareholder activists, who manipulate the law to achieve objectives outside normal legislative and administrative bounds. In 2014, the Institute began to study the issue of overcriminalization, the idea that state and federal criminal codes are overly expansive and growing too quickly. At the federal level alone, Institute fellows have identified over 300,000 laws and regulations whose violation can lead to prison time. The Institute asserts that this puts even well-meaning citizens in danger of prosecution for seemingly innocuous conduct. From 2014 to 2016, the Institute produced reports on the status of overcriminalization in five states ( North Carolina,  Michigan,  South Carolina,  Minnesota,  and Oklahoma ) and is continually adding more state-specific research. Cory Booker speaks about the City of Newark at a Manhattan Institute event in New York City on May 22, 2008. ^ a b Taranto, James. "How Trump Is Like Early Giuliani". The Wall Street Journal. Retrieved 19 September 2018. ^ "Manhattan Institute for Policy Research Inc" (PDF). Foundation Center. Retrieved 27 February 2017. ^ a b R. Emmett Tyrrell, After the Hangover: The Conservatives' Road to Recovery (2010), p. 187. ^ a b c Jason Stahl, Right Moves: The Conservative Think Tank in American Political Culture Since 1945 (2016), p. 112. ^ Riley, Sam G. (1995). Biographical Dictionary of American Newspaper Columnists. Greenwood Publishing Group. ISBN 9780313291920. ^ Robert Asen, Visions of Poverty: Welfare Policy and Political Imagination (2012), p. 76. ^ "Adult New York Times Best Seller List for April 12, 1981" (PDF). ^ Faludi 1991, p. 289. ^ Timothy Roth and Bruce Bartlett, eds., The Supply-Side Solution (1983), p. 1. ^ Myron Magnet, The Millennial City: A New Urban Paradigm for 21st-century America (2000). ^ a b Torry, Saundra (September 14, 1992). "Walter Cronkite Video Helps Stir Up Debate Over Tort Reform". The Washington Post. Retrieved 2009-03-10. ^ Joel Spring, Political Agendas for Education (2014), p. 107. ^ "New U.N. Tower Could Sit Atop Another Target". The New York Sun. ^ "Steven Malanga Speaks at the CATS Roundtable Radio Show". 7 December 2015. ^ "Nicole Gelinas". Manhattan Institute for Policy Research. Retrieved 19 September 2018. ^ Calomiris, Charles W.; Meltzer, Allan H. (February 12, 2014). "How Dodd-Frank Doubles Down on 'Too Big to Fail'". ^ Epstein, Gene (April 14, 2012). "The Big Flaws in Dodd-Frank". ^ "IQ2 debate: Is "Big Pharma" to blame for rising health care costs?". MPR News. October 21, 2016. ^ MacGillis, Alec (30 November 2016). "Would Washington's FDA Fix Cure the Patients or the Drug Industry?". ProPublica. ^ "'Project FDA' works to help patients by streamlining medical review process". Atlas Network. ^ "The Manhattan Institute celebrates City Journal's 20th anniversary". Manhattan Institute. 2014. Archived from the original on 7 July 2012. Retrieved 11 July 2015. ^ "About City Journal". City Journal. 2 October 2015. ^ a b Friedersdorf, Conor. "Saving the City: An Interview With Brian Anderson". The Atlantic. ^ Choi, Amy (March 4, 2014). "Defying Skeptics, Some Business Schools Double Down on Capitalism". Bloomberg Business. Retrieved 24 February 2015. ^ "Student Chapters". 8 April 2016. ^ Shapiro, Gary (November 27, 2006). "Manhattan Institute Aims At Academia". New York Sun. Retrieved 24 February 2015. ^ Cohen, Patricia (September 22, 2008). "Conservatives Try New Tack on Campuses". New York Times. Retrieved 24 February 2015. ^ "Former Senator Tom Coburn Joins Manhattan Institute as Senior Fellow". Manhattan Institute. ^ "Young Leaders Circle". Manhattan Institute. 25 August 2015. ^ "About Us". Economics21. 5 April 2016. ^ Sahm, Charles (November 16, 2016). "A Beacon of Excellence". U.S. News. ^ Olesen, Darien (December 1, 2015). "Thriving or Surviving? Manhattan Institute examines quality of life in NYC". Empire State Tribune. What does the quality of life look like in New York City today? Are New Yorkers thriving or merely surviving? These are questions Manhattan Institute has been asking in its social media-geared publication, “The Beat”—a series of newsletters addressing current urban issues. ^ "Police Commissioner Bratton Sits On Quality Of Life Panel". NYPD News. November 19, 2015. ^ Robert A. Katzmann, Daniel Patrick Moynihan: The Intellectual in Public Life (2004), p. 194. ^ "Urban Policy". Manhattan Institute. ^ "Welfare". Manhattan Institute for Policy Research. 2013. Archived from the original on 23 October 2013. Retrieved 19 September 2018. ^ "Losing Ground, by Charles Murray". Conservative Monitor. Archived from the original on 30 May 2016. Retrieved 19 September 2018. ^ "Did welfare reform work?". Politico. ^ "President Obama Announces Another Key Administration Post". 5 June 2013. ^ ernestosilva (12 February 2015). "Howard Husock, Member, CPB Board of Directors". www.cpb.org. ^ Malanga, Steven. "Pension tidal wave is about to crash down on taxpayers". Washington Examiner. ^ Malanga, Steve (12 January 2015). "The Pension Sink Is Gulping Billions in Tax Raises". Wall Street Journal – via www.wsj.com. ^ "Stockton's Unlearned Lessons". City Journal. 23 December 2015. ^ "Boardwalk Vampire". City Journal. 27 January 2016. ^ "The Lessons of Harrisburg". City Journal. 23 December 2015. ^ Daily, Investor's Business (3 October 2016). "In Fast-Growing Texas, Local Debt Has Soared". City Journal. ^ "Pension Collapse in Big D". City Journal. 9 December 2016. ^ "Steven Malanga". City Journal. ^ "Greg Abbott's pension board pick draws protests from labor". ^ "Law enforcement group urges Gov. Abbott to rescind pension board appointment - Politics - Dallas News". 1 December 2015. ^ Shlaes, Amity (January 15, 2015). "Public Unions vs. the Public". The Wall Street Journal. ^ Board, Post Editorial (29 January 2017). "How to fix the Port Authority". New York Post. ^ "Report proposes radical Port Authority shakeup". ^ Wilson, James Q.; Kelling, George L. (March 1982). "Broken Windows". The Atlantic. Archived from the original on 23 April 2016. Retrieved 19 September 2018. ^ "Why We Need Broken Windows Policing". City Journal. 2015-12-23. Retrieved 2017-05-03. ^ Pooley, Eric (January 15, 1996). "One Good Apple". Time. ^ Blankstein, Andrew; Therolf, Garrett (2006-12-27). "L.A. crime decreases for 5th year – Los Angeles Times". Articles.latimes.com. Retrieved 2010-03-16. ^ "Los Angeles Police Chief Faces a Huge Challenge". Nytimes.com. Retrieved 2010-03-16. ^ Jacobs, Andrew (2007-05-27). "Newark Battles Murder and Its Accomplice, Silence". The New York Times. Retrieved 2010-05-12. ^ Steven Malanga (2007-04-26). "Cory Booker's Battle for Newark" (Spring 2007). City-journal.org. Retrieved 2010-03-16. ^ Heather Mac Donald (July 15, 2008). "Cities You Can Believe In". Washington Post. Retrieved 2010-11-04. Many American cities began their decades-long decline in the 1960s, when crime started spiraling out of control. ^ Donald, Heather Mac (29 May 2015). "The New Nationwide Crime Wave" – via www.wsj.com. ^ "Opinion - More on the 'Ferguson Effect,' and responses to critics". The Washington Post. ^ "Detroit traffic cops learning stop and frisk tactics". Fox News. 20 August 2013. ^ Newsroom, Michigan Radio. "New police program in Detroit proves effective". Michigan Radio. ^ Miller, John (June 28, 2002). "What's Next for School Choice? Lots of possibilities, but also plenty of problems". National Review. ^ "Friction Over Experimental Schools". The New York Times. 25 May 1995. ^ Walters, Laurel Shaper (September 2, 1993). "School Choice in East Harlem". The Christian Science Monitor. ^ Prothero, Arianna (June 20, 2014). "Denver Special Ed. Gap Not Driven by 'Counseling Out', Says Study". Education Week. ^ Board, Post Editorial (14 March 2017). "Fresh signs that de Blasio's discipline 'reforms' endanger kids, teachers". New York Post. ^ "Manhattan Institute's Mark Mills Named Energy Writer of the Year". Manhattan Institute. ^ "Oren Cass" (PDF). www.orencass.com. ^ Hargreaves, Steve (1 July 2011). "New York set to lift fracking ban". CNN Money. New York City. Retrieved 5 July 2011. A report last week from the conservative Manhattan Institute said allowing drilling in New York could inject over $11 billion into the state economy in the years ahead. ^ a b "Missing Benefits, Hidden Costs: The Cloudy Numbers in the EPA's Proposed Clean Power Plan". Manhattan Institute. 15 June 2016. ^ "Why the media must play a bigger role in policing unsafe medical devices". Health News Review. ^ "Health Policy". Manhattan Institute. Retrieved 2016-04-15. ^ "One-Size-Fits-All Rules Will Hurt Drug Quality". The Wall Street Journal. 4 April 2007. Retrieved 19 September 2018. ^ Lichtenberg, Frank R. (1 October 2005). "Older Drugs, Shorter Lives? An Examination of the Health Effects of the Veterans Health Administration Formulary". Retrieved 19 September 2018. ^ "No, Obamacare Has Not Saved American Lives". The National Review. ^ "Legal Reform". Manhattan Institute. Retrieved 2016-04-15. ^ "Proxy Monitor". www.proxymonitor.org. Retrieved 2016-04-15. ^ "Overcriminalizing America | Manhattan Institute". Manhattan Institute. Retrieved 2016-04-15. ^ "Trial Lawyers, Inc.: Class Actions and Mass Torts | Manhattan Institute". Manhattan Institute. Retrieved 2016-04-15. ^ "Overcriminalizing the Old North State: A Primer and Possible Reforms for North Carolina". Manhattan Institute. 24 August 2015. ^ "Overcriminalizing the Wolverine State: A Primer and Possible Reforms for Michigan". Manhattan Institute. 24 August 2015. ^ "'Overcriminalization' a Problem in South Carolina". Manhattan Institute. 19 January 2016. ^ "Overcriminalizing the North Star State: A Primer and Possible Reforms for Minnesota". Manhattan Institute. 22 February 2016. ^ "In Reforming Oklahoma Criminal Justice, Don't Forget Overcriminalization". Manhattan Institute. 17 February 2017. ^ Andra Gillespie, The New Black Politician: Cory Booker, Newark, and Post-Racial America (2013), p. 134-135. ^ "Moving Men into the Mainstream". Manhattan Institute. 25 August 2015. ^ "Gov. Christie to outline plan for returning prisoners to society". ^ "Repeat offenders in N.J. prison system are draining state budget, report finds". ^ "Inequality Does Not Reduce Prosperity: A Compilation of the Evidence Across Countries". Manhattan Institute. 24 August 2015. ^ "When Moving Matters: Residential and Economic Mobility Trends in America, 1880-2010". Manhattan Institute. 9 November 2015. ^ "Ideas for the New Administration: Tax Reform". Manhattan Institute. 12 December 2016. ^ "Diana Furchtgott-Roth". www.iwf.org. Independent Women's Forum. ^ "The Wage Subsidy: A Better Way to Help the Poor". Manhattan Institute. 25 September 2015. ^ Celarier, Michelle (June 11, 2013). "Hedgies cut ties with think tank". New York Post. Retrieved 24 February 2015. Jennifer Medina, "A Reversal on School Vouchers, Then a Tempest", New York Times, Feb. 13, 2008.